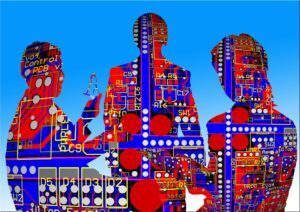 It might surprise you to learn artificial intelligence (AI) has its roots dating back to ancient Greek mythology. Greek myths of Hephaestus, the blacksmith who manufactured mechanical servants, and the bronze man Talos incorporate the idea of intelligent robots. Many other myths in antiquity involve human-like artifacts. Many mechanical toys and models were actually constructed, e.g., by Archytas of Tarentum, Hero, Daedalus and other real persons. It accelerated after the developments of modern computers following World War II. As we’ve realized in the 21st century, AI presents both benefits and risks. Business and all of society benefit from the superintelligence provided by AI as long as technology is effective and productive. Competence and goals are important. AI outperforms many functions by humans but it’s problematic if your computers crash, are hacked or are programmed with bad intentions or develop destructive methods. So, the question arises: How does a company maximize its return on investment in AI? While AI has the potential to cut expenses, the focus should be on growth and expansion. That includes innovation in products and services, efficiency for productivity and gaining market share. AI is optimized when adopted at every level of technology from value chains to pricing and understanding the preferences of customers. You cannot fully benefit from AI in technology if your employees aren’t prepared. Your culture must be transformed. It’s a complex process. You must start slowly in baby steps. You must anticipate your future needs. Management and staff must be educated and trained in cross-functional teams, if you will, in all processes and operations. Then, another dilemma – finding the right people for the new jobs – recruitment of new employees for the requisite technical job categories. Your best bet is to stay focused on growth – innovating new products and fine-tuning your business model. Cutting expenses are certainly important, but it shouldn’t be the salient focus. To better capitalize on the technological benefits of AI, stay on offense. AI is maximized if you retain access to strong data and assimilate it into your systems. This means having a simultaneous intensity devoted to your AI and digital systems. Your systems aren’t effective and true assets unless they’re fully used – from all of your technology in operations and customer service to your financial system to employees. Take steps to insure you have an abundant AI environment for success, an increase in knowledgeable workers, U.S. job creation, AI knowledge and related benefits. Make certain its fully embedded in your organization. Lead by example in your sector. As in other public-policy issues affecting your business, be proactive in encouraging government policies to further the development of AI ecosystems. What do I mean? For instance, lobby for tax AI breaks and in immigration for tech visa quotas. Support research grants, public-private sector partnerships and insist on protecting citizens’ privacy in data. Future of the Workplace: Robots Making Business ‘Smarter’ — If there was ever a need for people to become expert in technology and learn senior-management skills, the time is now. Non-exempt, lower-level jobs are disappearing. New software “robots” in numerous industries are increasingly taking over and making business “smarter,” according to senior-level managers who responded to a survey.